If you have a newborn you may be concerned about to choose baby products for the loving one. And when it comes about diapering there are a lot of diaper brand in markets and have many categories. You would be confused to pick the best one or perfect for your baby. We researched and make a guideline with cloth diapers reviews of several diapers. And this will save a lot of time and get the clear idea about cloth diapers to buy from markets or online world. Economical: You can save a huge amount of money by using baby cloth diapers rather than disposable diapers. 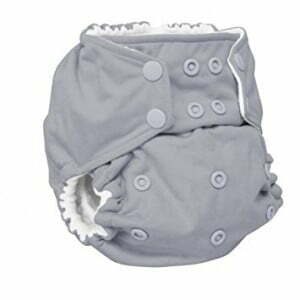 The Initial large upfront cost of cloth diapers can be spread out by continuous use. And for any new sibling or your next bundle of joy (the baby), you can keep them for further use. Healthier: Using of cloth diaper have no diaper rashes. But it has more chance with using of disposable diapers. Environmental: Those diapers are much better than disposable because of environmentally friendly. The components (chlorine, polyacrylate and other chemicals) of disposable diapers are not ecological and also not good for baby’s skins. Attractive: Cloth diapers are cute and pretty look thus place a decent position in the modern age. Those are come with well design and varieties of colors to fit with baby’s body, thus baby fell comfort and happy. Flat cloth diaper: The old fashioned simple diapers, which can be foldable and consist of single layered of fabric with same thickness overall the cloth. Your grandmother would suggest you about this types of the diaper for your baby. 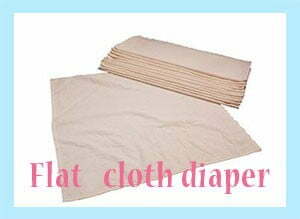 Pre-fold cloth diaper: Those types of diapers are little smaller than the flat diaper and already folded. Multiple layers of fabrics exist in these types of nappies. 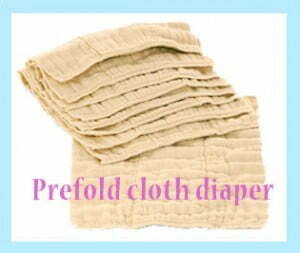 The pre-fold are the kind of cloth diaper very easy to clean and dry. And better absorption power than the flat diaper. They are also used as inserts in diaper cover and need to be folded to fit in a cover. 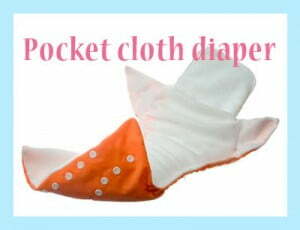 Pocket cloth diaper: The pretty look pocket cloth diaper has two layers. The outside is waterproof and inside has a part to place inserts or external absorbency pad to the pocket diaper. It has very good absorbance power because of insides inserts. And during night time you can control absorbency power by using 1-2 pads in the pocket of your baby’s diaper. 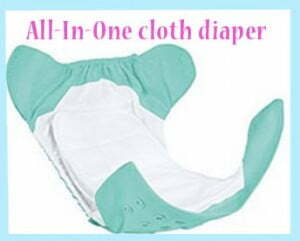 All-In-One cloth diaper: All-In-One cloth diaper comes closest to disposables in terms of easy of use. Those are same like as pocket diapers.The key difference is they are single (the waterproof layer, the absorbent layer, and the layer against skin are all sewn together in one diaper). 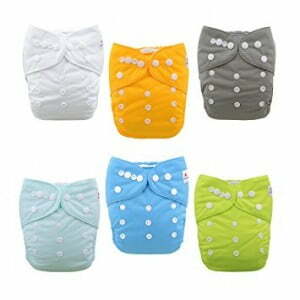 All-in-one cloth diapers are costly but very effective in diapering solution. They can be the great solution for daycare providers to use. 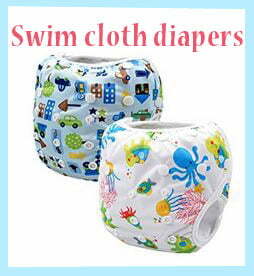 Swim cloth diaper: Swim cloth diaper consist of a waterproof cover and light mesh type liner on the inside. The main function of this diaper is to hold poop solid. Swim diapers are used when your little baby is playing in water (like pond or beach).The are used to deal with baby’s poop. 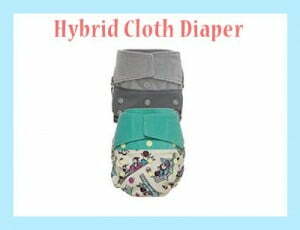 Hybrid /All-in-Two cloth diaper: Hybrid cloth diapers consist of two layers (de touchable inserts and outer waterproof cover). They are slim in fitting, easily customize wetted inserts at night time or travel time. And this is called hybrid because of the inserts can be reusable or have the option of disposable inserts as mother’s choice. Flat and prefold diapers are most suited to newborns due to their unusual body shape. One-Size Cloth Diapers fit most babies from 8 to 35+ pounds. That means they will be fitted your baby from a few months after birth to potty training. 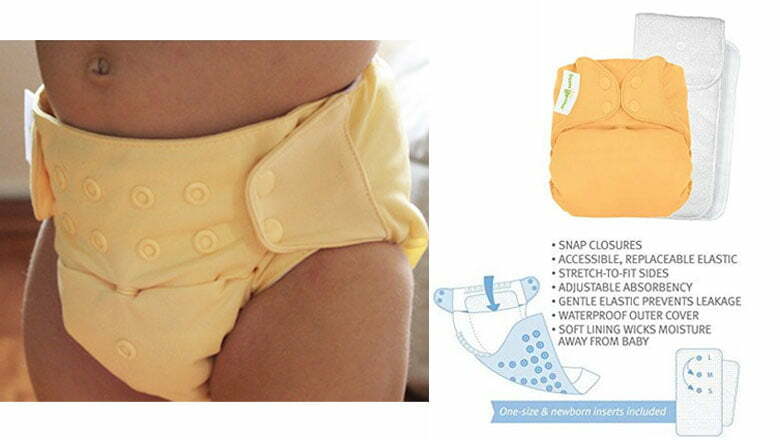 And do not have to worry about size because of the adjustable diapering system. For sized cloth diaper you will need to choose the size that is appropriate for your baby’s figure. Sized diapers tend to have a really great trim fit than the one-size diaper. They are designed to fit for 1 age/size range and less expensive than one-size cloth diapers. Some essentials for baby diapering system can be catalysts to do work easily, shortly and help to lead healthy baby. Disposable or Cloth Wipes: Disposable wipes are widely available.Now flushable and biodegradable versions are available on the market. You can use this disposable wipes also. Cloth Wipes are cloth forms of disposable wipes. Washcloths and baby cloths can also be used. You can wet any clothes with warm water or a homemade mixture. Diaper Pail: You need a diaper pail, pail liner or large wet bag to store dirty diapers before washing. A diaper pail will not only store your dirty cloth diapers but also help prevent them from starting to stink as well. You can also use the common trash jar for dirty diapers if you think diaper pail is an extra expense.There are many varieties of sizes and shapes exist in markets of Diaper Pail and it can be reusable for another baby at home. Some pail liners are disposable and some can be washed along with the diapers. Wet Bags: The wet bags are alternative to diaper pails are used while away from home or visits to anywhere. 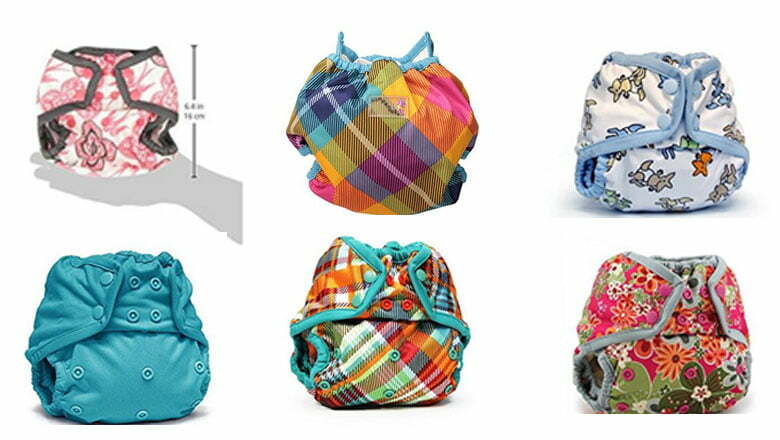 The dirty diaper’s carriers (wet bag) are available in multiple design and size (small or medium wet bag). The waterproof bags can be hung on with doorknob or hook. Some wet bags are available with zipper closures wit machine washable and some are with handles to make easy carrying. A diaper sprayer is considered as an extra expense to some people and someone fell the essential item for easy work. A diaper sprayer can remove poop from cloth diaper as expert hands and may help to keep free your hands from poop cleaning. Diaper sprayer hooks up to the toilet’s water supply and allows to direct spray on poop into the toilet and flush it away. It also can be used to clean out potty chairs. Cloth diapers can make a less work than they seem. Thinking about switching from disposables to cloth diapers for your little one? 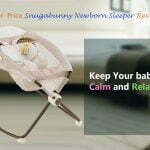 And are you concern about less expense for diapering system?Let’s have a look at the best cloth diapers reviews (recommended by thousands of mothers) that can give you a quick solution to choose the best one rather than searching and spend a ton of time to surf the internet. The softest, most absorbent and durable natural pre-fold diapers for babies come from OsoCozy. Now they placed best-selling pre-fold cloth diaper in the online market. The 6 pieces pre-fold are in one packed which are fitted for 15-30 lbs baby and used with diaper cover or as inserts in pocket diapers. The rectangular shaped OsoCozy Prefold is sewn together of several layers fabrics. These diapers are super soft and strength. 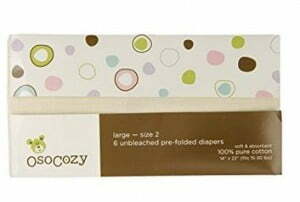 OsoCozy Prefold diapers are very versatile. When those are not used for infant parents can use as rag polishing, burp cloths, and others chores at home. Suitable for the newborn baby because of their unusual body shapes. 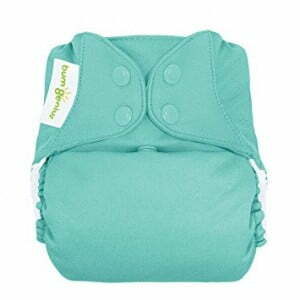 The Rumparooz cover is a one-size diaper with four rows of three torso snaps that allow the diaper to adjust between four sizes which are extra small, small, medium, and large.These pocket diapers are made of waterproof and biodegradable TPU and they can be fitted with 6 lbs to 35+ lbs baby. Waterproof polyester TPU with varieties colors and fashionable prints are used in the Rumparooz Newborn Cloth Diaper Covers. This Newborn Cloth Diaper Cover is designed by featuring 3 adjustable size settings for preemie and newborn.You can use Pre-folds, Lay-in Soakers, Fitteds or this disposable inserts for both diaper cover. The One-size cloth diaper comes with a small and lightweight insert for newborns and a larger one-size insert for growing baby. The standard size of this diaper makes fit with a newborn (7 pounds) to growing (35+ pounds) baby. The Snap Closure diaper allows you to easily adjust the size of the diaper as your baby grows. You need no more sorting diaper by size also allow you to leave carrying from multiple diapers when you visit somewhere. It is also suggested to wash diaper cover and the insert separately with adding a little salt.The Alva Baby 6pcs Pack Cloth Diaper colors are gender neutral thus it will be fit to your any baby boy or girl. Washable and attractive for outside’s colorful snaps. Some users like to argue that Chinese diapers are not safe. 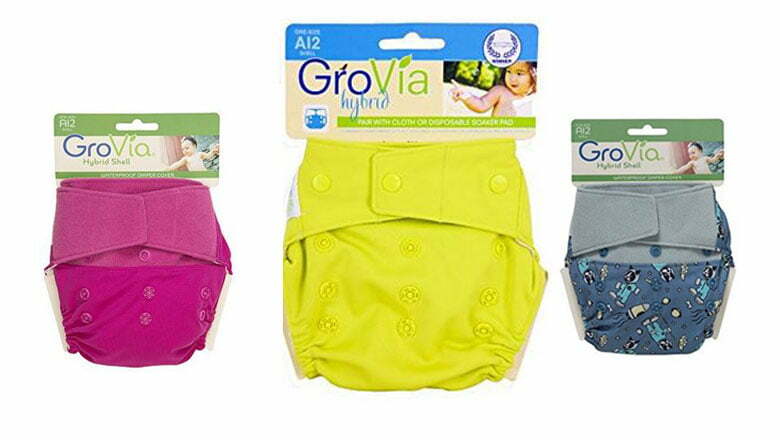 As hybrid diapers are the combination of cloth and disposable diapers, GroVia hybrid diapers are innovative in diaper world. Those diapers can be used with prefold cloth diapers or inserts and also can be used with this eco-friendly disposable GroVia’s BioSoakers pad . This hybrid diapers place the position in mothers heart because of not only everyday use but also supportive diapers during travel (you can simply throw the soiled insert without worry during travel). 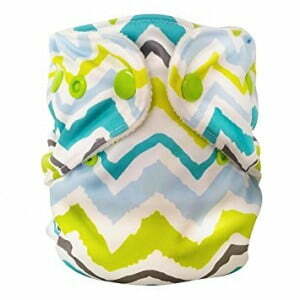 The Waterproof TPU outer layered diaper comes in both hook and loops or snaps closures. And If you want to see a happy look of your baby boy this GroVia loop closure hybrid diapers would be a great solution. Washing the diapers not only removes dust and left over chemicals from the manufacturing process but also shrinks the diaper to their appropriate size. Clean the child thoroughly with wipes to keep sanitize of baby health. Changing your baby promptly is the key to preventing diaper rash, though it has less chance by using cloth diaper. Use a new wipe each time and diaper changing time is a great opportunity to make bonding with kids. Talk and sing to your little one, make eye contact and use your soothing touch. Before buying diapers hope the above guides and cloth diapers reviews will be helpful.